Conor Byrne: "Willing Executioners" - do the German people have a history of persecution which renders them different to other nationalities? "Willing Executioners" - do the German people have a history of persecution which renders them different to other nationalities? Two famous authors in their respective fields, Daniel J. Goldhagen and Anne L. Barstow, have suggested in their works that the German people have a long history of persecution which in some way renders them unique amongst other nationalities. Leading to accusations of racism or xenophobia, both have maintained that German persecution was fundamentally unique in its evil. Yet is this the case? This article will consider both the merits and flaws of the examples given in these works in order to deduce whether their claims can be supported. These two case studies will be considered in debating this disturbing question. Barstow is a historian specialising in European witchcraft and is notorious in academia for her pro-feminist perspective. Indeed, some have suggested that she takes it to the extremes and her claims can therefore be said to be nonsensical. 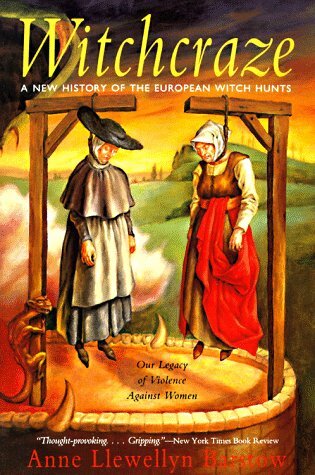 Her book "Witchcraze: A New History of the European Witch Hunts" is, however, harrowing in the details it provides of the tragic mass persecutions of thousands of 'witches' - mostly women - across Europe, ranging from Scotland to France to eastern Europe to the German lands. Perhaps the most graphic case study, gruesomely described, is that of the Pappenheimer family in 1600. A brief overview of this case will be given before deciding whether the Germans really were unique in their persecution, in this case of witchcraft. This family, in 1600, were dwelling in Bavaria, Germany. The Pappenheimer family were amongst the lowest in the social system prevalent in Bavaria at this time, and even today their name can be used as a nickname for a garbage man. Paulus was the father, and was married to Anna, who was in her fifties in 1600. They had three sons, Jacob, Gumpprecht and Hoel/Hansel, who was only ten at this time. The family's occupation was that of beggars. They thus attracted hostility and contempt from their neighbours. Undoubtedly, however, this family was not only targeted because of its low social status but because they were Lutherans in a Catholic duchy; as in Europe during the sixteenth and seventeenth centuries, Germany was ravaged by religious hostility, often leading to widespread bloodshed and execution which accelerated in the witch-hunts. Not by coincidence was the persecution of witchcraft most severe in German lands, largely because of religious upheaval. Selected by a thief, the family were accused of witchcraft. On the order of the Duke, Maximilian I, who ruled Bavaria, the Pappenheimers were taken to Munich and tortured into confessing to everything they were accused of. Contemporaries, in the words of Michael Kunze, identified this family as "instruments of the devil", probably because of both their contemptible social status and heretical religious beliefs. Indeed, Kunze suggests that "Duke Maximilian certainly regarded the execution as a means to stabilize safety in his country", through rooting out heresy which divided his people. The family confessed to hundreds of crimes, including theft and murder, although the severe torture meted out to them certainly means that we cannot treat their confessions as true or honest. They also admitted to sorcery and named accomplices. Meanwhile, Anna's chest cavity bled. As the carts lurched along, the injured prisoners were in agony. Nonetheless, they were forced at one point to get down from the carts and kneel before a cross, to confess their sins. Then they were offered wine to drink, a strangely humane act in the midst of this barbaric ritual. One can hope that between the wine and loss of blood, the Pappenheimers were losing consciousness. They had not been granted the 'privilege' of being strangled before being burned, but in keeping with the extreme brutality of these proceedings, they would be forced to endure the very flames. The four Pappenheimers were then tied to the stakes, the brushwood pyres were set aflame, and they were burned to death. Their eleven-year-old son was forced to watch the dying agonies of his parents and brothers. We know that Anna was still alive when the flames leapt up around her, for Hansel cried out, 'My mother is squirming!' The boy was executed months later". This horrific case study can only be viewed as exceptional in the European witch hunts in the period 1550-1750. Undoubtedly, they were most severe in German-speaking lands, as other scholars have identified, and exemplified by infamous persecutions in Trier, Wurzburg and Bamberg. Barstow takes this trial as evidence of the gender-orientated nature of the witch-hunts, sadistically torturing and murdering women in ways which reflected both the perpetrator's sexual longings and fear, even hatred, of women. Yet does this provide evidence that the Germans are a nation who persecute others more violently and cruelly in times of crisis - ie. social problems, economic unrest and religious upheaval in the 1600s - than other nations? If Daniel J. Goldhagen is to be believed, then yes. Obviously, the two historians focus on significantly different periods; Barstow witch persecutions in the sixteenth and seventeenth centuries, Goldhagen the extermination of the Jews during World War Two. Yet both scholars indicate that Germans are exceptional in their desire to persecute others. This is demonstrated graphically in Goldhagen's notorious book, "Hitler's Willing Executioners: Ordinary Germans and the Holocaust", published in 1996. For those who are not aware of Goldhagen's thesis, he suggests that ordinary German people turned against their Jewish neighbours during the Nazi dictatorship out of underlying anti-Semitism and hatred towards Jews, acting in conjunction with a bloodthirsty desire to exact brutal and sadistic revenge on what they deemed 'inferiors'. Not only, in Goldhagen's eyes, were 'Germans' anti-Semitic beliefs about Jews... the central causal agent of the Holocaust', but 'ideas about Jews that were pervasive in Germany... induced ordinary Germans to kill unarmed, defenseless Jewish men, women, and children by the thousands, systematically and without pity'. However, as Carr warns us, 'study the historian before you study the facts'. This wise quote should be considered in relation to both Goldhagen and Barstow. Goldhagen is not only Jewish, but is the son of a Holocaust survivor. Without wishing to sound disrespectful or make it simplistic, this will obviously colour his interpretation of the tragic events in the period 1939-1945. Barstow, on the other hand, is a renowned feminist, who seeks to approach the witch-hunts from a gendered approach. In concentrating on a notorious German trial, this allows her to convey the alarming way in which men tortured and murdered women during these persecutions. Yet as other scholars have warned, we cannot look at events in a 'keyhole', obscuring both context and other factors. Yes, as Goldhagen suggests, there was significant anti-Semitism prevalent in Germany, but so was there also in other countries such as France, the Iberian Peninsula and Eastern Europe. In relation to Barstow, it cannot be ignored that in some countries, such as Russia and Iceland, more men than women were actually tortured and killed for witchcraft, and far from torture reflecting the punishers' sadistic desire to exact violence and torture in a sexual means upon women, men were brutally tortured in this way too. In Russia, a favourite torture was to apply pincers to the scrotum. Between 100 and 150 men of the battalion surrounded the burning synagogue. They collectively ensured that none of the appointed Jews escaped the inferno. They watched as over seven hundred people died this hideous and painful death, listening to screams of agony. Most of the victims were men, though some women and children were among them. Not surprisingly, some of the Jews within spared themselves the fiery death by hanging themselves or severing their arteries. At least six Jews came running out of the synagogue, their clothes and bodies aflame. The Germans shot each one down, only to watch these human torches burn themselves out". "The inescapable truth is that, regarding Jews, German political culture had evolved to the point where an enormous number of ordinary, representative Germans became - and most of the rest of their fellow Germans were fit to be - Hitler's willing executioners". This case study is chilling, harrowing, in its detail. Both Goldhagen and Barstow, it has to be said, employ dramatic, harrowing, gruesome language to support their views that Germans willingly sought scapegoats for the evils befalling their society, albeit in very different circumstances and time periods. Yet both academics have been heavily criticised for their interpretations. Barstow's critics denounce her arguments, suggesting that she uses evidence in a very selective way to build up a narrow, one-dimensional argument, while Goldhagen's opponents similarly critique his inability to recognise that other European populations acted in similar ways to the Germans. Anti-Semitism, for instance, was widespread in Eastern Europe - where it still is - while Browning has provided evidence of Luxembourgers' complicity in willingly killing Jews. As other historians remark in relation to genocides, if there are 'ordinary Germans', there are also 'ordinary Croats', 'ordinary Hutus', 'ordinary Turks', etc. In relation to Barstow's book, she herself provides evidence of barbaric cruelty visited by one people against another in times of crisis, for instance in referring to the victorious Spaniards' widespread violence and sadistic cruelty inflicted upon native Indians. This included feeding living people to dogs, burning them alive, and randomly decapitating body parts at will. It was very rare for condemned witches to be burned alive at the stake; often, they were strangled beforehand, and this occurred in other German lands, so the Pappenheimer trial has to be seen as exceptional amongst others. The persecution of witches in the sixteenth and seventeenth centuries was an European-wide phenomenon, with unbelievable cruelty inflicted upon the condemned. To suggest that it was worst in Germany because of the German people's history of persecution against 'the Other' is wildly erroneous. A more balanced argument would suggest that Germany experienced the worst witchcrazes because religious division was greatest there than anywhere else. Geography and social/economic factors were undoubtedly central too. Other countries were not far behind Germany in the numbers of witches persecuted, including Scotland and France. Spain was also ready to punish those it deemed deviant harshly, as seen in the infamous 'auto de fe' in the medieval period where condemned heretics were tied to pyres and burned alive in Spanish towns, Spanish citizens celebrating during this fiery event. Goldhagen's book has been the subject of considerable hostility and academic criticism, which readers can access in a variety of articles. Although German anti-Semitism cannot be doubted, attention must be paid to the extraordinary nature of the Nazi dictatorship, where, as Browning remarks, 'repression was real'. Goldhagen's view attaches little importance to this factor, which understandably leads to a distorted interpretation of life in Germany in the 1940s. Moreover, not all Germans approved of 'The Final Solution' or extreme anti-Semitism. There is evidence to show that 'ordinary Germans' actually voiced pity and sympathy to Jews when they witnessed them on marches. Persecution, undoubtedly, has been severe in Germany. Tragic events have led some scholars to hypothesise that the German people are characterised by xenophobia, intolerance, hatred and anti-Semitism, willingly and bloodthirstily participating in the violent torture and execution of enemies. However, this cannot with any validity really be substantiated. The Pappenheimer case study was extreme, and although other witch-hunts in Germany, such as Trier, were horrific in the violence involved and the widespread torture and execution of many victims, it is erroneous to imply that this was worst in Germany because of its citizens' inner traits, since other nations endured similarly horrific witch-hunts. Anti-Semitism, similarly, was rife in Germany in the twentieth century, yet many supported the Nazi regime not necessarily out of hatred of Jews and a desire to violently murder the Jewish race. Many were not aware of the nature of the 'Final Solution' and some who were readily disapproved of it. Unfortunately, almost all nations have a history of persecution, hatred and hostility to those it deems enemies. In moments of crisis, this underlying hostility is brought to the fore in a desperate attempt to restore 'normal' conditions. Germany is a tragic example of just how horrific this desire to achieve stability can be.